Among many definitions of the Chinese term kung fu is the rough translation “skill achieved through hard work.” Clark University first-year student Cheyenne R. Lachapelle, of Worcester, is just beginning to prove how far her hard work and passion for this challenging martial art will take her. In October, Lachapelle ’19 defended her title at the 5th Annual New England Chinese Martial Arts Championship, where she won the 2015 Traditional Northern Women’s Grand Championship. Lachapelle has been involved with kung fu since age 3 and earned her black sash at age 12. She also participates in tai chi and Chinese Lion dance. She practices at Shaolin Kung Fu Centers in Worcester, where she is known as Sije (“older sister”) Cheyenne and grew up learning from peers and her father, Sifu (“teacher”) Gary Lachapelle. 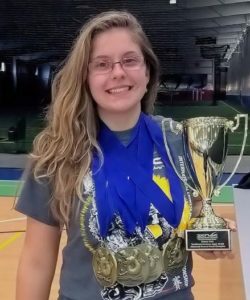 Cheyenne Lachapelle ’19 recently defended her Grand Champion title in kung fu at the 5th Annual New England Chinese Martial Arts Championship. 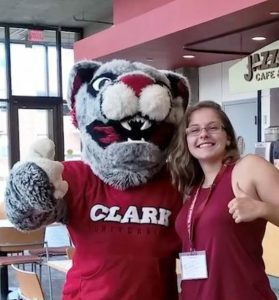 At Clark University, Lachapelle majors in biology and is a recipient of the Traina Scholarship. Her excellence in martial arts and academics also garnered scholarship support from the Helen Gee Chin Scholarship Foundation. Lachapelle’s extra-curricular interests include the student-led Salsa Club, Science-Fiction People of Clark, and the Association of Martial Arts Club. Lachapelle is a 2015 graduate of South High Community School in Worcester.